Oh, that is too weird! I think I went to that Museum and saw those too when I was growing up. My Dad's sister and her family were living in Chicago then. And we went there - I think. Didn't Cinderella's castle have her carriage outside? Weren't there antique cars or carriages somewhere else in that Museum? That's all I can call up - but I think it was dark in there. I don't even know the last time I thought about that before this post. I love the Legos buildings - *that's* the job I'd like. I worked at the museum for two years, back in 2001-2002, so I can answer some of Elizabeth's questions. Cinderella's carriage was in the court yard. The display room is kept dark, in part for preserving that artifact, and part to show it to dramatic effect. There were antique cars in the room you walked through to get to the castle. There was another display of antique racers down in another wing too. One year during the employee picnic, the collections department was repairing one, and they took me for a ride in it! 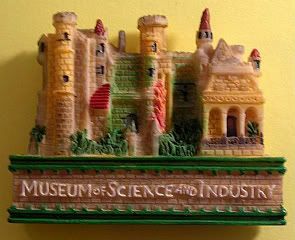 My parents took me to the museum once as a child, and I was enchanted by the castle. The blue Mold-a-Rama did indeed exist, because I had one. I kept it in my room for years, and added some sparkle by gently painting it with glitter nail polish.